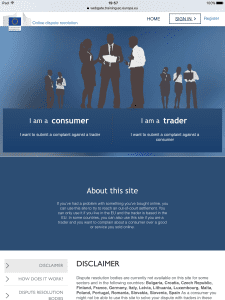 On Monday 15 February 2016, the new European Union Online Dispute Resolution platform (the ‘ODR Platform’) will be available for use by consumers and traders. The ODR Platform will allow consumers and traders to settle their online disputes both for domestic and cross border purchases of goods and services, without the need to go through lengthy and costly court proceedings. The ODR platform refers disputes only to ADR entities who are included in the national lists of ADR entities that comply with the binding quality requirements established by the ADR Directive, such as ProMediate. The ODR Platform will provide confidence to both the online trader and consumer, particularly cross border (although it is not confined to cross border disputes), knowing that any potential dispute can be settled in a prompt and low­cost way. Currently 60% of EU traders do not sell online to other countries because of the difficulties in resolving a problem if a dispute was to arise. The ODR Platform will encourage online traders such as these to broaden their trading relationships, and consumers to purchase from other member states. This is on top of the requirement to provide details of a certified ADR entity to consumers in the event of a dispute that cannot be resolved, which came in from 1 October. Member States are to provide rules on penalties applicable to infringements of the European Regulation on Online Dispute Resolution (‘ERODR’) and shall take all measures necessary to ensure that they are implemented. Currently, non­compliance with the ADR Regulation could result in being liable to Trading Standards’ civil enforcement action which may result in a court order to comply with the Regulations. Any failure to comply with such a court order could result in an unlimited fine or up to two years in prison. If you are in any doubt about the next steps or how to comply with the Regulation, ProMediate would be pleased to help.